Daisukeis a Chief Performance Instructor at the　BITS Performance Studio in Tokyo, Japan; specializing in rehabilitation, functional training and diet, Daisuke is also director and co-owner ENZ Inc. His integrative and individualized programs have helped athletes and individuals improve performance, prevent injuries, rehabilitation and improve health and vitality. 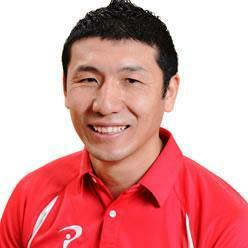 He was a well known former rugby player for Japan National team, Nissihin Seiko, YAMAHA Rugby team. He also was a technician and had worked the motor cycles development division of YAMAHA Motor CO. Major big size motor cycles such as American type, SR400, and XJR1300 were developed by him. Daisuke received high school degree from Osaka Namisyo High School in Osaka, Japan. He is also a Certified Food Coordinator. Daisuke is strength and conditioning coach for many top professional athletes from the JGTO Tour, JLPGA Tour, J-League, NPB to top Japanese Olympians. Shinobu Moromizato won 6 JLPGA tours in 1997 and he was a conditioning coach.